A lot of people, a lot of firms talk about volunteering but Jennifer Shydler, a wealth management advisor for Bank of America Merrill Lynch, walks the walk. And, she says, so does her employer. Shydler, a certified financial planner, volunteers as a Big Sister to a young woman named Jala. Shydler has more than 1,000 hours of volunteer work under her belt, accumulated through a number of organizations. Shydler was working as a runner for an attorney when she was walking past a Bank of America and saw a sign seeking tellers. The increase from $6 to $9 an hour motivated her to apply and work hard in that role. She worked her way up from teller to financial advisor. Q. How does Bank of America entice you to be active in volunteering and philanthropy? A. They’ve been encouraging it ever since I started here in ’99, so it’s not something new; they’ve always had it. A huge core value of ours is giving back to the community. So, there’s always something; there’s Three Square, we’re going to be doing a food drive, or a clothing drive for (another organization), so you have so many different options available to you that whatever it is that you’re passionate about, Bank of America’s got it. You just step in and say that’s something I’d like to go do. Bank of America encourages us … and gives us financing. We’re able to go to the MGM Women’s Leadership Conference to enhance our skills. The fact that Bank of America makes that investment in us is huge. If you’re a salaried employee, they’ll give you two hours of paid time, per week, to go volunteer, at any organization, including your church. So, the bank’s really encouraging to do whatever it is you’re truly passionate about. Q. How did land your dream job with Bank of America? A. It was just through one of my friends, growing up in the bank, who said I’ll turn your resume in and then two weeks later I was hired for my dream job. That was February 2008 as the market crashed; but that’s where you really get in the trenches and you really learn about what it takes to become a financial advisor. Once you have a certain amount of high net worth clients, then you become a wealth management advisor. Q. 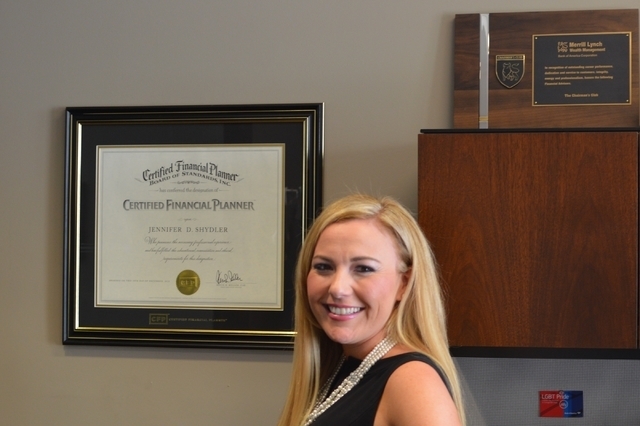 Why was it important to you to get your Certified Financial Planner certification? Q. What was it like for you coming into your dream job at the height of the Recession? A. At first, I was like, ‘great timing.’ How lucky am I? But in retrospect it was the best time to start because there was never a time that I was complacent. I think that if I had entered in a bull market when everything was going up, it would be like ‘oh, this job is easy’, ‘I don’t have to do that much.’ When I entered as everything was crashing, I was there to hold people’s hands when maybe their prior advisors where hiding under their desks. So I was able to create a lot of trust. You’re giving them advice and guidance, to help them get to a place of peace of mind, because when the markets are down it’s only temporary. Market’s go up and markets go down; those are the two guarantees that I can always offer our client. Your value is going to go up and it’s going to go down. But I never felt like it was my fault as to why the markets were going down. What I did take personally was if somebody was really upset about what was going to happen. I’d say lets just take a step back and put together an entire financial plan so that you know exactly what’s going to happen. It’s very much about the relationship and I take so much pride in somebody who’s like 70 or 80 and has forgone vacations and fancy cars so that way they made sure they put this money into savings for their future. The fact that they’re trusting me with that decades’ worth of savings is so humbling and keeps me so passionate about it. That’s how I’m personally affected by working with the client. Q. How do you build a strong portfolio for someone looking for security? A. What we focus on is companies that are strong, long-term companies… that are paying a nice consistent dividend, so even if the stock doesn’t have a huge amount of appreciation, you’re still getting some sort of return via the dividend. Those dividends are actually taxed at lower rates as well. So, it’s really putting together a very diversified portfolio — don’t have all your eggs in one basket, don’t have too much exposure to very risky asset classes. You want to have it in strong companies… that have proven financials. My core competency is in doing the comprehensive financial planning for my clients. Q. What’s one way in which Bank of America gives you the freedom to be yourself? A. If I need to go see Jala, if Jala needs to do something, I can leave work right now. I am my own boss so I am able to create my own schedule and figure out how I want my work-life balance to be rather than being mandated. I love that Bank of America Merrill Lynch gives me the freedom to be able to do that and have that balance in life.